Director of Research & Instruction. 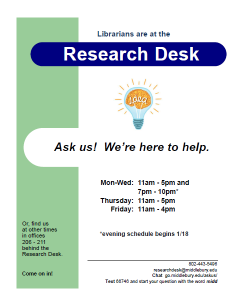 Research Desk hours for the fall semester begin on Sunday, September 10. Send any questions over to us! How to cite a web site ? How to find more scholarly articles? Where to look for statistics? …We can help with all of that and more! 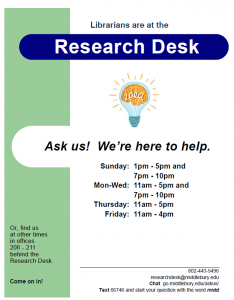 Refer research questions to the Research Desk, or to librarians in the offices behind the Research Desk. Contact info and hours below and at http://go.middlebury.edu/askus. Next week, the first President’s Course at Middlebury and Midd-Monterey will begin. It’s called Water in an Insecure World: Symbol, Resources, or Commodity (INTD 0285A). 20 Middlebury students and 20 MIIS students are enrolled in the course. In addition, alumni have been invited to follow along separately. You might receive questions like the ones below…. Where and when does the course meet? Alumni have been invited follow along at their own pace separately. Where is the course website? Alumni have a separate alumni course website. Where are the course readings? 3) Log in to MIIS E-Reserves and search for instructor Brayton, Patton, or ZarskyIn addition, there are two books required for this course. They are available on both campuses via Print Reserves. The books are not available via E-Reserves. Alumni have been given this advice on how to find course readings online or through their local library. Reminder that Middlebury alumni can get many articles through alumni access to JSTOR and Project Muse (see go/jstoralum). More questions? Ask Carrie (cmacfarl@middlebury.edu, x5018) or Bill (bkoul@middlebury.edu, x5002). You won’t see librarians at the Research Desk again until Sunday, July 3, but if the library is open, librarians are around! The go/askus page tells you how to find us. If you receive a research question, please don’t hesitate to refer it to us. During regular hours, the easiest thing to do is to call x5496. That number rings in all librarian offices, and one of us should be available to help on the phone or in person. Try us even outside of regular hours, just in case! You’re welcome to walk over to our offices, too! Most of us are in the row of offices behind the Research Desk. Please encourage all researchers to drop by! It’s not interrupting. It’s our job! A Write-In will take place in 3 locations at the Davis Family Library on Wednesday, May 4, from 8-11pm. Most activity will be in LIB201 (tutor, librarian, food, group work), but students who wish to work quietly will be invited to use LIB145 and the Harman Reading Room too. I’ll post signs in Harman on Tuesday. How to cite a web site in a bibliography? How to find more (or fewer!) scholarly articles? Where to look for statistics? We can help! Research Questions? Send them to the Research Desk! We’re ready for research questions! Research Desk hours resume on the first day of classes, Wednesday, September 16. We’ll also be at the Research Desk on the afternoon of Tuesday, September 15. Please send any research questions over to us! We’re happy to help. If you don’t see someone at the desk, simply call x5496 or write to us at http://go.middlebury.edu/askalibrarian. Or, walk over to our offices behind the desk! In the fall, there were a few questions about when a research librarian would be available. 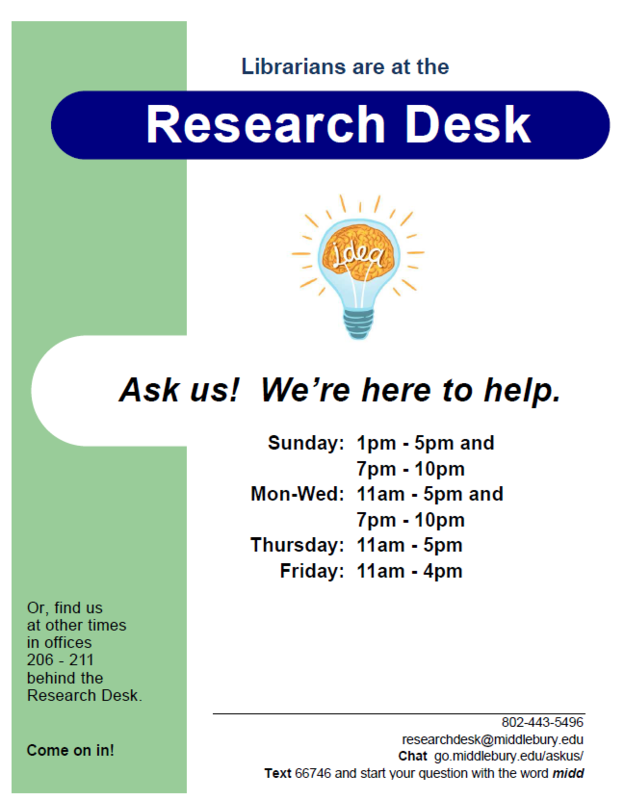 Our hours are posted on the research assistance page at http://go.middlebury.edu/askus, but you also may write to us using the askalibrarian form. That’s the best way to reach all of us during off-hours; it sends an email to all librarians. You won’t see librarians at the Research Desk again until Monday, September 8, but if the library is open, librarians are around! The go/askus page tells you how to find us. If you receive a research question, please don’t hesitate to refer it to us. During regular hours, the easiest thing to do is to call x5496. That number rings in all librarian offices, and one of us should be available to help on the phone or in person. Try us even outside of regular hours! Often, at least a few of us are here even during the dinner hour. You’re welcome to just walk over to our offices, too! Most of us are in the row of offices behind the Research Desk. You won’t see librarians at the Research Desk again until Sunday June 29, but if the library is open, librarians are around! The go/askus page tells you how to find us. If you receive a research question, please don’t hesitate to refer it to us.